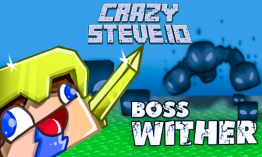 CrazySteve.io | Play CrazySteve.io free on iogames.space! With each new level, you increase slightly. Together with the volume, the ability of your character to Crazy Steve io to collect apples and glasses increases, but at the same time you slowly slow down and become more vulnerable to attacks by fast rivals. the Top player quickly opens the hunting season, the players are scampering the field in search of a 'fat boy.' So the more points you score, the sharper the battle becomes! Another feature of Crazy Steve io is that you can undermine your own checker.Once you can throw 3 pieces at once, only after the explosion of one of them you can throw a new one.There are different helmets, wooden, iron, gold, diamond and trolley, put them on or sit in the trolley to be more protected! Apples and eggs appear on the map all the time, they usually fight in the center and therefore one should periodically look at the edges of the map to collect a large crop of glasses. Steve moves toward the cursor. Left mouse button Steve attack. Steve accelerates with the right mouse button. The best strategy is to blow up the biggest players, but when you become big, will not they kill you?